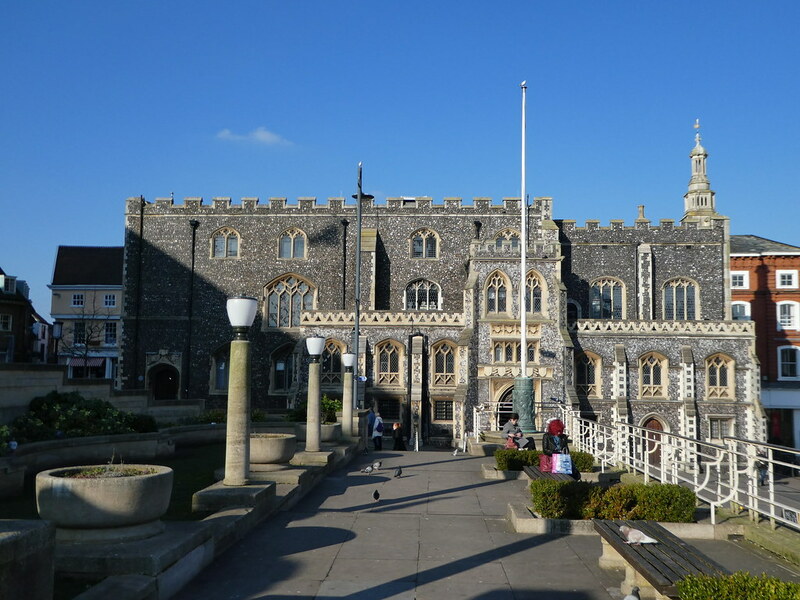 After enjoying recent weekends away in Bristol and Birmingham we decided to turn our attention to Norwich and take a look at the county town of Norfolk. Norwich lies approximately 100 miles (161 km) north east of London in East Anglia. We travelled by train and coming from the north of England, I took a Virgin East Coast train to Peterborough from where I changed onto an East Midlands service to Norwich. For passengers arriving from London there is a direct service from Liverpool Street station. As I was leaving the station, I glanced back to admire the attractive building which is built around a central clock tower with matching wings on each side. 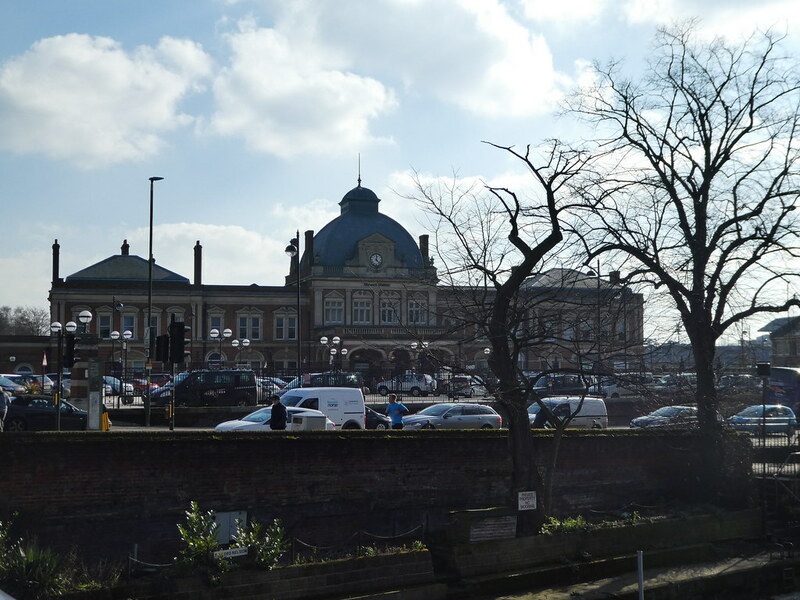 It was a deceptively sunny, yet extremely cold afternoon as we followed signs to the city centre, crossing a bridge over the River Wensum on our way. Mid-way between the station and the centre lies the Travelodge Norwich Riverside where we had reserved a room, so after leaving our luggage we were able to start exploring. 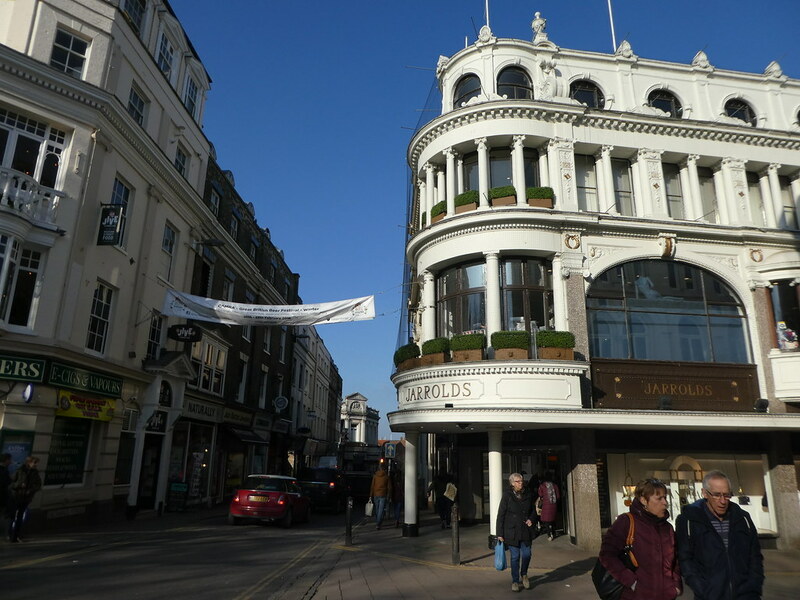 Our first stop was to the Jarrold’s Department Store on London street. This family business is one of the most renowned landmarks in the city and has been trading in its current building since 1823. After taking a look around the store, we enjoyed a light lunch in the Pantry restaurant located on its top floor. Across from Jarrold’s lies the Guildhall on Gaol Street. This historic building was constructed between 1407-1413 and served as the seat of city government from the early 15th century until the 1930’s. At the time of the building’s construction and for much of its history, Norwich was one of the largest and wealthiest cities in England. Nowadays the Guildhall is used as an events venue and cultural centre. Continuing our walk, we browsed the outdoor market on Gentleman’s Walk with over 200 stalls selling everything from fresh produce to household items. Not far from there, we strolled along the Norwich Lanes which are a series of alleyways, courtyards and open spaces. It was fascinating wandering along these car free lanes with their delightful array of small independent shops, cafes and galleries. Just off Tombland (originally Norwich’s market place) we arrived at the entrance archway to the Anglican Cathedral. Set on a 44 acre site, the cathedral is one of the finest Romanesque churches in Europe boasting the second tallest spire in England, after Salisbury and unlike many other cathedrals in the U.K. admission is free. 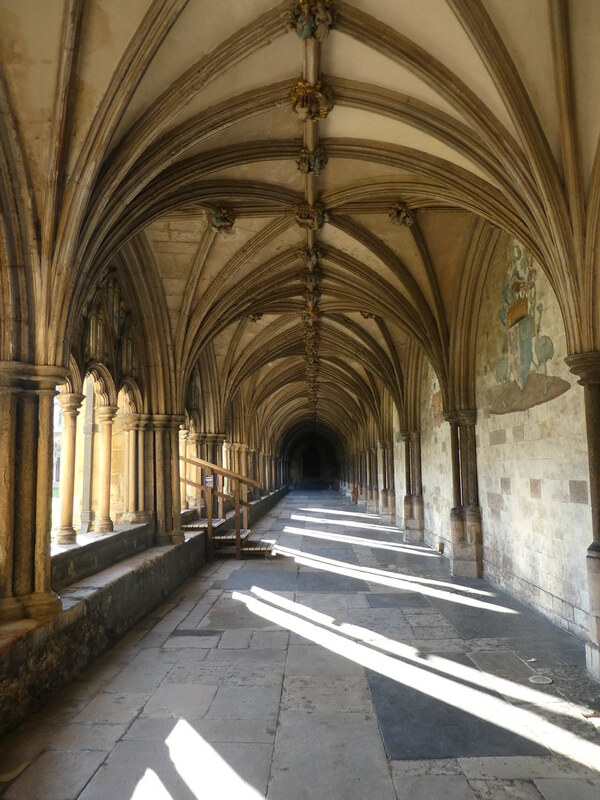 We strolled through Cathedral Close with its many listed buildings and beautiful tranquil spaces. Clusters of snowdrops were a promising sign that spring was around the corner. Entering the cathedral through the largest monastic cloister in England we admired the stunning medieval high arches and roof bosses. The interior of the cathedral was beautiful with its sumptuous decorations, elaborate carvings and stained glass windows. I was fascinated by the unusual font and read about its history. The confectionery company Rowntree Mackintosh was a major employer in Norwich and in 1969 Rowntree took over the Mackintosh factory which made toffee. The factory eventually closed in 1994 and later gifted to the cathedral two of its burnished, copper bowls formerly used in the manufacture of toffee. These bowls now form a shining, modern font with historic links to the city and its certainly a talking point to be able to say you were baptised in a toffee making bowl. On our way back to the hotel we made one final stop at the Royal Arcade. Designed by George Skipper and opened in 1899, it is one of the most beautiful covered streets in Norfolk. 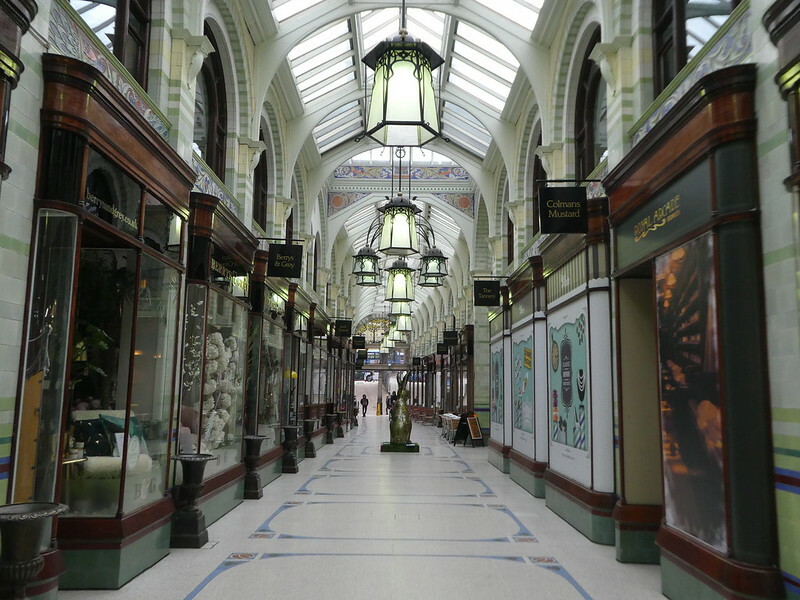 At the time of construction, arcade shopping was immensely popular and browsing the shop windows today, it’s home to many high-end retailers. Only just stumbled across this! Norwich is my local city and even after living here for so many years, I still have so much to learn about the place. I had no idea those fonts came from the old toffee bowls! Always fantastic to read what others pick up on in the city when they visit, thanks for sharing! Definitely inspiring me to get out and explore a little more around Norwich! Thank you for taking the time to comment on my blog. It’s much appreciated. Great photos and another interesting read. The colourful market looked lovely, and the font in the Cathedral was certainly unusual and unique. Thank you for sharing. Nice post. Norwich is my home city so what a surprise to find it featured pm WP. Thank you, nice to read you enjoyed this post! Love Norwich. I’ve always been surprised how it seems to slip under the radar for so many, when it is really well worth visiting. Thanks for bringing back some memories. Thank you for making contact and for your kind words. Norwich is indeed lovely and shouldn’t be overlooked ! Thanks Val for your kind words. Norwich is beautiful. Thanks Helen for your interesting thoughts. Norwich is a great city to visit and we loved it too! I hadn’t heard about the font before we visited the cathedral but we just noticed it walking round. 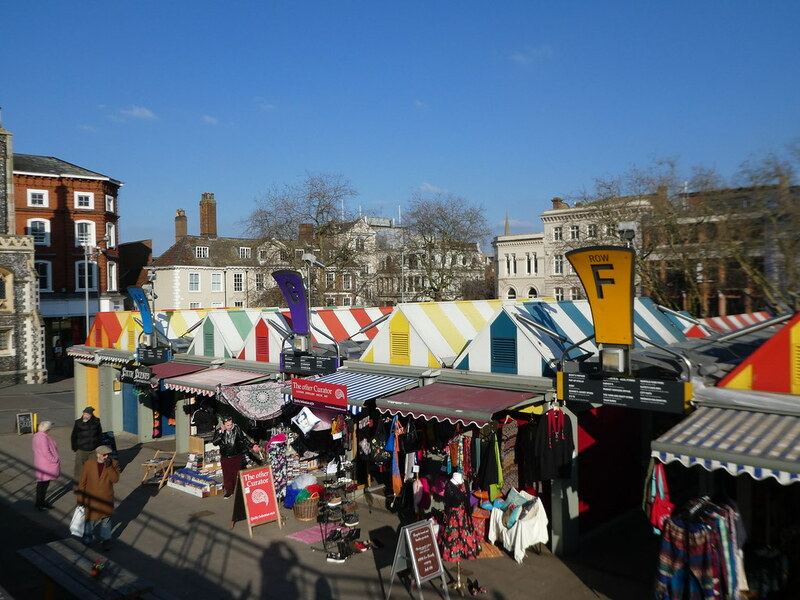 Another great post – loved being reminded of all the great things about Norwich. Haven’t been in a few years so a return visit is now definitely on the cards for 2018. We loved our long weekend in Norwich and would be happy to return again soon, perhaps for a trip in the Broads! Thanks Andrew for your welcome thoughts! Marion what a lovely trip and I love the thoughts of clusters of snowdrops; haven’t seen those in years. We have plenty of snowdrops even in our own garden and although they are lovely, but I’d swap some anytime for some warmer weather. It’s unbelievable that I’m still wearing boots, gloves and a woollen scarf in mid-April! And sorry to tell you that we are having an unusually really warm spell for Autumn. I can’t stand it. You would love it. What a great back story about the toffee font! The thing that most impresses me about these old churches is the limited machinery and tools that the builders had at their disposal. I marvel at the engineering and workmanship involved. I enjoyed the tour. Thank you for your interesting thoughts Leah. I also marvel at the marvel of engineering in these old churches and other buildings. Such an interesting post, as always, Marion! Thanks Sue for your kind words. It’s so nice to read that you find my posts of interest. We were so fortunate with lovely weather, it makes such a difference ! Gorgeous! 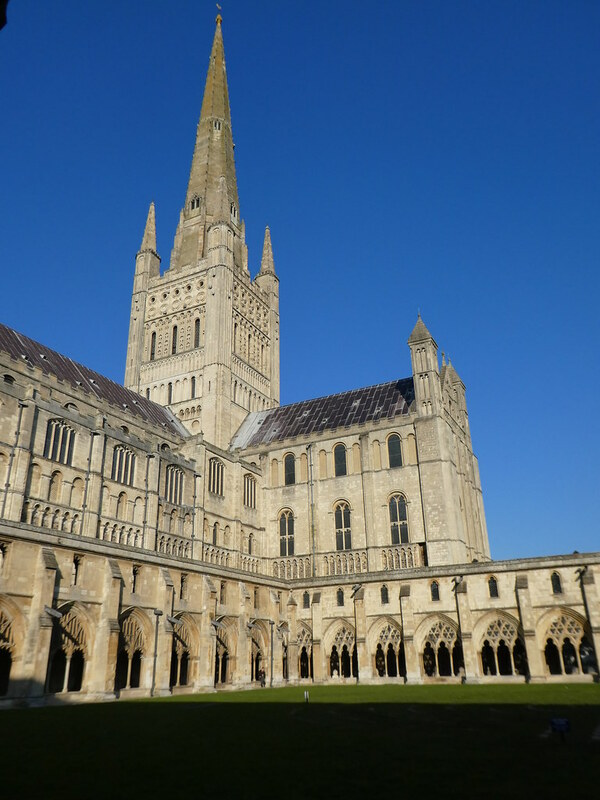 The Norwich Cathedral looks amazing! Fabulous pics. Thanks for sharing. Thanks Ingrid for your much appreciated thoughts. Norwich Cathedral is stunning. Thank you for your interesting thoughts. The Book Hive certainly looks somewhere that you would want to pop in, a lovely old fashioned book shop! Norwich is certainly full of character and is a lovely place to spend a few days. Thank you for your much appreciated thoughts. I’m glad to hear you enjoyed your trip to Norwich! It’s quickly become one of my favourite cities in the UK – I love just wandering around the picturesque centre, and the cafe scene is second to none. Look forward to reading about the rest of your weekend break! Thanks Rosie for your kind words, can easily see why you rate it as one of your favourite U.K. cities – we loved our stay there. Norwich is one of my favourite places to go. I can understand why Rosina, it’s such a lovely, historic city. Oooh I never saw that bookshop when I went two years back. Bummer! A good excuse to return Lana.norwich and it’s small independent shops are gorgeous! Great post! The weather looks awesome, would love to visit some day! It was cold but beautiful and sunny. Norwich is a lovely place and just right for a short break. 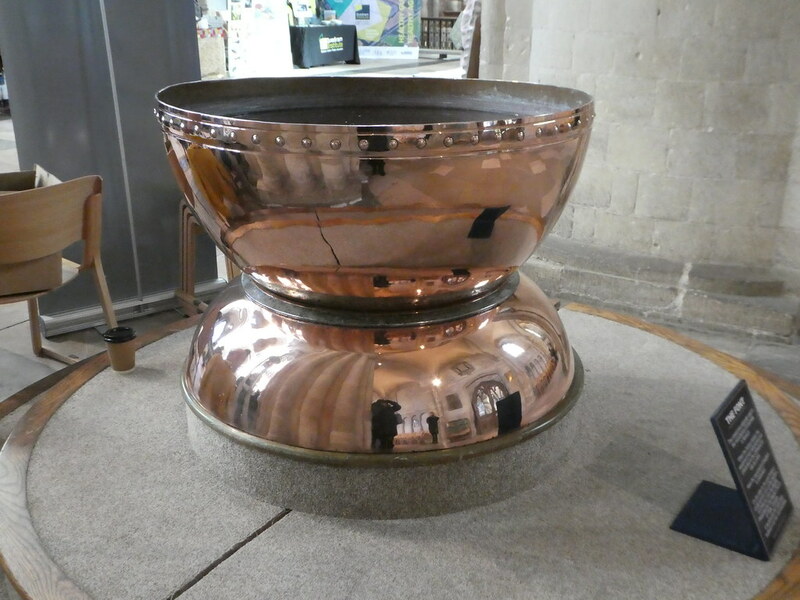 I love the copper font in the cathedral! Imagine the job of keeping it polished! Thank you for sharing your travels! I hadn’t thought of that, but I expect someone takes pride in polishing the font. Thank you for making contact, it’s most appreciated. Thank you for your comments, Norwich is indeed a lovely, historic city. My hometown! So lovely to hear about it from a traveller’s viewpoint – I keep meaning to head out there with my tourist hat on to see for myself. Looking forward to hearing more about your trip. Thank you Leanne for your kind words. We thought that Norwich was absolutely lovely. Yes Norwich is beautiful. We did visit the castle the following day. Oh my, there is so much to see in England, isn’t there! Cute, picturesque, historical everywhere. Enjoyed this post, Marion! Thank you Snow. Although I like to travel overseas, the U.K. also interests me with its history and nature. I can see why! ☺️ My mum’s husband is British and they always show us such beautiful pictures from their holidays there, driving around. Thanks Jo for your welcome thoughts. We loved our long weekend in Norwich finding lots to see and do. Hopefully you will get an opportunity to return sometime and see a little more. I must admit I was put off Norwich after having the misfortune to spend a Saturday night in the Premier Inn in the centre of the city, right next to all the night clubs/pubs. Having been kept awake all night, first by the shrieking sounds of revelers in full swing, and then by screaming, and the sounds of someone throwing up comprehensively in the street outside and four in the morning, I may have done the place an injustice. It certainly looks interesting enough. Oh dear Stella, that didn’t sound a good start! We were there Thursday to Sunday and didn’t encounter any issues despite wandering through the city centre late at night. I hope you will be encouraged to return sometime in the future and give the city another try as there are so many nice things to see and do. Thank you so much for your kind words. Its especially nice to receive them from a local! We loved our weekend in Norwich and found so much to do there. 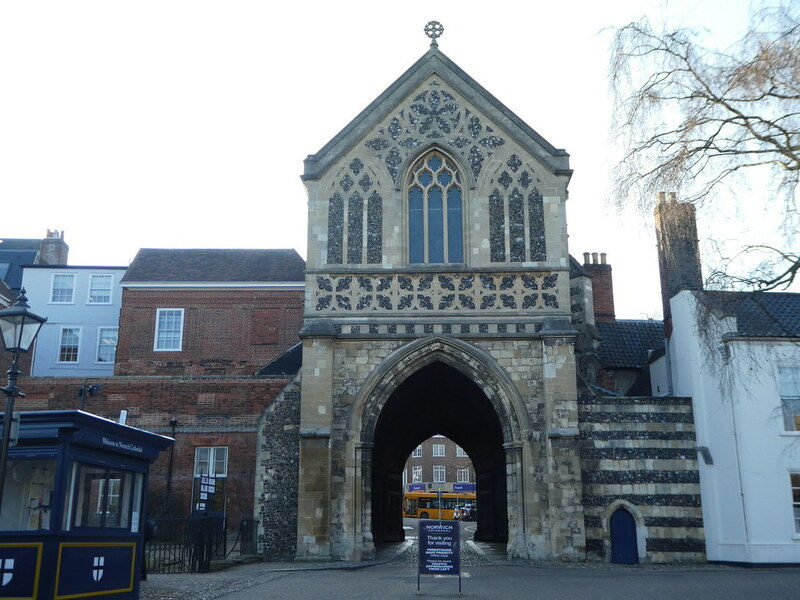 Thanks Rachel for your interesting thoughts on the first post on my series on Norwich. I do hope you get an opportunity to visit sometime. Also, I’ll definitely take a look at your blog and wish you well with it. You have done extremely well to trace your family tree back to 1590 Ian! Architecture was indeed very grand in those days.